Houston Methodist Continuing Care Hospital is the first specialty hospital in the Houston Methodist family. 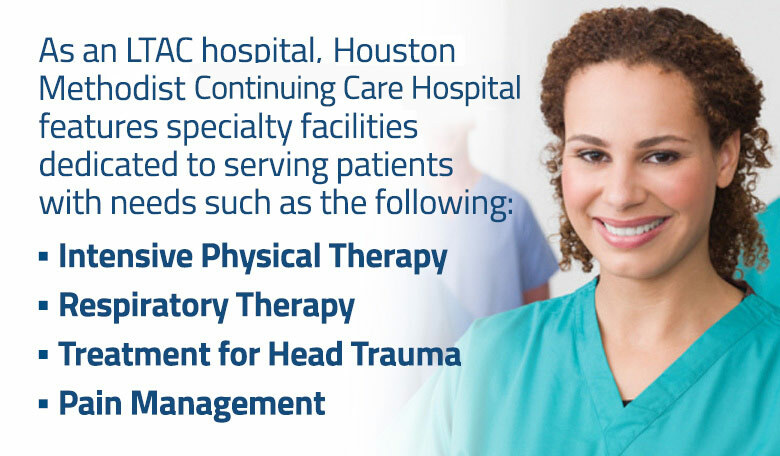 Houston Methodist Continuing Care Hospital proudly serves the Katy and West Houston communities as a fully accredited, specialty hospital focused on the needs of patients requiring long-term acute care. Many long-term acute care (LTAC) patients simply need daily care from a dedicated medical team for a longer period (typically 25 days or more) before they are well enough to return home. Houston Methodist Continuing Care Hospital offers exceptional career opportunities for professionals in Nursing, Allied Health and Support Services.